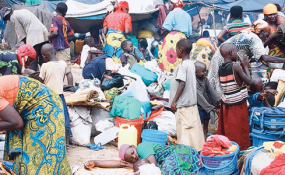 The United Nations High Commission for Refugees estimates that a total of $270 million (about Sh600 billion) is required in response to the needs of displaced Burundian and Congolese refugees living in various camps in Tanzania (file photo). With both governments confirming plans to return 116,000 Burundians by the end of 2019, it's crunch time for the international community if it wants to ensure returns are truly voluntary and offer returnees the level of support they will need to reintegrate properly back in Burundi. Limited repatriations began in 2017, but funding shortages mean the process has so far been little more than an offer of free transport back across the border, with a return package of food, non-food items, and cash that doesn't even last the three months it's expected to cover. Burundi appears to be calm for now, but this shouldn't hide the fact that the government has restricted political space and refuses to engage in a regional dialogue with opposition parties. Ensuring a properly supported return process has never been more important. Several people told us they found the repatriation process slow. Others felt there was insufficient information to guide them through it, despite several systems put in place by the UN's refugee agency, UNHCR, in Tanzania to inform refugees about the procedure. Some were relying on the help of their neighbours or local authorities. But there were occasional tensions too as some who didn't go into exile resented the fact that returnees received support - however insufficient. Returnees said they had been accused of being opposition supporters and some reported being threatened - even physical abused - by the ruling party's notorious Imbonerakure youth wing militia. In Burundi, the 2015 exodus reversed a repatriation process between 2002 and 2010 in which approximately half a million refugees returned following a number of peace agreements, including the Arusha Accord, which ended the country's civil war. But while the returns made it look like Burundi had found peace, stability only went skin deep. The much harder and time-consuming work of genuine reintegration of returnees didn't fit well with the short attention spans, or at least budgets, of the government and UN agencies. Something similar seems to be taking place now. While most refugees don't want to return to Burundi because they know they'll be returning to a volatile political situation and economic hardship, many feel they have no better choice. As the IRRI report demonstrates more fully, the situation faced by Burundian refugees in Tanzania is dire - many are abused when leaving the camps to look for firewood or menial jobs to supplement the insufficient humanitarian assistance. Burundi and Tanzania both want the refugees to return. Tanzania is tired of hosting them, fed up with aid that is sporadic and unreliable, while Burundi's government wants to portray an image of a peaceful country. UNHCR and international donors, however, have been more reluctant to support returns, leading to friction. But there seems to be lack of recognition - or, at least, of action - by the Burundian government and international actors in this regard. In a context in which displacement has had terrible consequences for the quality of life of hundreds of thousands of people, recognising repatriation as a long-term endeavour is key to breaking the cycles of conflict and displacement that have plagued Burundi's recent history. Globally, repatriation is being pushed as the most desirable and "durable solution" to end displacement. It is therefore vital that the international community ensures that Burundians return voluntarily and are sufficiently supported and funded to reintegrate effectively.